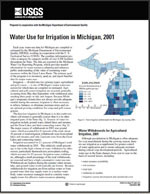 The Upper Midwest Water Science Center provides credible and relevant scientific information on critical water resources issues in MI, MN, WI, and beyond. 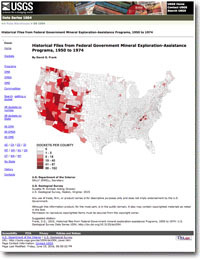 Major focus areas include Great Lakes, ecosystems science, hydrologic monitoring networks, flood frequency and mapping, water availability, and effects of agricultural and urban practices, mineral extraction, and other human activities. Developing a Science and Monitoring Strategy to Guide Recovery of Fisheries Habitats and Populations in the St. Clair-Detroit River System. 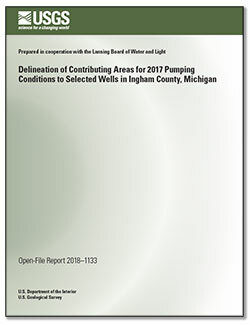 Luukkonen, C.L., 2018, Delineation of contributing areas for 2017 pumping conditions to selected wells in Ingham County, Michigan: U.S. Geological Survey Open-File Report 2018–1133, 11 p., https://doi.org/10.3133/ofr20181133. Estimated Secchi-disk transparency (eSDT) and corresponding estimated trophic state index (eTSI) values. Available online are estimated Secchi-disk transparency (eSDT) and corresponding estimated trophic state index (eTSI) values for Michigan inland lakes. 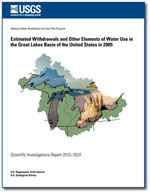 To view available eSDT for Michigan inland lakes greater than 20 acres without interference from clouds, cloud shadows, dense vegetation or shoreline, go to the Michigan Lake Water Clarity Interactive Map Viewer. 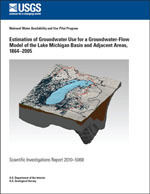 Processing, Analysis, and General Evaluation of Well-Driller Logs for Estimating Hydrogeologic Parameters of the Glacial Sediments in a Ground-Water Flow Model of the Lake Michigan Basin; 2009; SIR; 2008-5184; Arihood, Leslie D.
Elsayed, E.; Faisal, M.; Thomas, M.; Whelan, G.; Batts, W.; Winton, J. 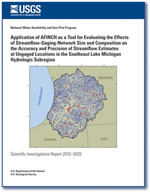 Isolation of viral haemorrhagic septicaemia virus from muskellunge, Esox masquinongy (Mitchill), in Lake St Clair, Michigan, USA reveals a new sublineage of the North American genotype; 2006; Article; Journal; Journal of Fish Diseases; Elsayed, E.; Faisal, M.; Thomas, M.; Whelan, G.; Batts, W.; Winton, J.
Morenz, Michele L.; Van Til, Ron L.; Luukkonen, Carol L.
Water use for irrigation in Michigan, 2001; 2005; FS; 2005-3079; Morenz, Michele L.; Van Til, Ron L.; Luukkonen, Carol L.
GCLAS is a program designed primarily to compute daily and annual loadings of constituents transported in streamflow. 2019 GLB NOSB 1st Place Winner Troy High School. The underwater autonomous vehicle sitting in a parking lot before being deployed. This is the autonomous underwater vehicle (AUV). Here, it is being tested in a hotel swimming pool. GLSC’s Aaron DeVries and Mckenzie Smith, left, discuss innovative controls for invasive Phragmites australis in GLSC’s greenhouse facility. Dr. Wendy Stott (GLSC) discusses the science carried out in the Ann Arbor aquatic research laboratory. GLSC Director Russ Strach presents the 2018 GLSC Moffett Award to lead author Yu-Chun Kao for his 2017 paper, Evaluating Stocking Efficacy in an Ecosystem Undergoing Oligotrophication, with GLSC coauthors Mark Rogers and David “Bo” Bunnell. Digital 3D reconstruction of lake bottom using 10 photo frames taken by the dive camera system. This reconstruction allows us to gain more insight about the lake bottom since elevation has been added to the photographs. Digital 3D reconstruction of lake bottom using 50 photo frames taken by the dive camera system. This example shows an arc since the sampling transect is a circle. This reconstruction allows us to gain more insight about the lake bottom since elevation has been added to the photographs. This meeting is part of the American Fisheries Society particularly interested in maintaining high standards for the fisheries profession and ensuring conservation of Michigan’s aquatic resources.